The basics to a good salad are fresh produce and a good mix of flavor and textures, but chia seeds are always a welcome addition. Use whole chia seeds in salads because the seeds add a little crunch and pack in the nutrients without affecting the flavor. However, if you prefer milled chia seeds, simply mix the milled seeds with the salad dressing before dressing the salad, and you can still benefit from all the extra nutrients. Slice the chicken breasts into thin, long strips and season well with salt and pepper. In a frying pan, heat the oil over medium heat; add the chicken strips to the pan and cook for 8 to 10 minutes, stirring occasionally until the chicken is nicely browned and cooked through. Set aside. 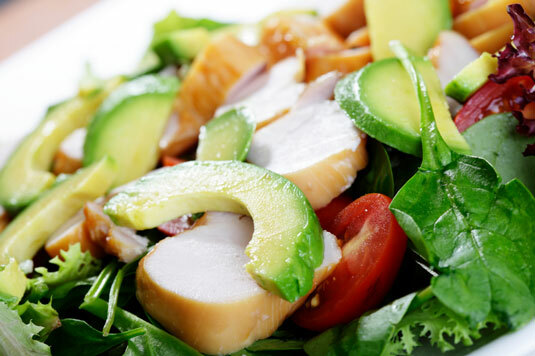 In a large bowl, combine the spinach and baby salad leaves. Wash and cut the cherry tomatoes in half. Peel the avocado and cut it into slices, removing and discarding the center stone. Add the tomatoes, avocado, cheese, pine nuts, and chia to the bowl of salad leaves. Pour the Honey Mustard Dressing over the salad and mix everything together with clean hands so that all the leaves get dressed with the oil. Add the cooked chicken strips on top. Serve immediately. In a small mason jar, mix all the ingredients. Put the lid on the jar, and shake vigorously until well combined. Per serving: Calories 878 (From Fat 610); Fat 68g (Saturated 14g); Cholesterol 107mg; Sodium 765mg; Carbohydrate 32g (Dietary Fiber 16g); Protein 42g. On an ovenproof plate, place the goat cheese and top with pepper. Place the plate under a medium grill for about 8 minutes, until the cheese is melted. In a frying pan, heat the oil over medium heat; add the sausage and fry for about 5 minutes, until the juices start to run. Remove the sausage from the pan and slice it thinly and again in half so they’re semicircle-shaped small pieces. Set aside. Cut the cherry tomatoes in half and add to the frying pan that the sausage was cooked in; cook for 1 minute so that the juices from the sausage cover the tomatoes and they start to cook. Remove the tomatoes from the heat and set aside. Chop the beetroot into 1-inch cubes and place on paper towel to absorb the excess liquid. Put the salad leaves on a large serving plate, and top with the beetroot, hazelnuts, and chia. Sprinkle the sausage and tomatoes over the salad. Scatter the goat cheese on top of the salad. Pour the Herb Dressing over the salad. Serve immediately. In a mason jar, combine all the ingredients. Put the lid on the jar and shake vigorously until well combined. Per serving: Calories 672 (From Fat 529); Fat 59g (Saturated 17g); Cholesterol 85mg; Sodium 1,059mg; Carbohydrate 13g (Dietary Fiber 5g); Protein 22g.